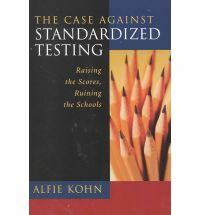 Alfie Kohn is one of the most vociferous critics of today’s standardised tests. Here he answers some questions frequently asked of him. Is it my imagination, or are we spending an awful lot of time giving kids standardized tests? It’s not your imagination. While previous generations of American students have had to sit through tests, never have the tests been given so frequently and never have they played such a prominent role in schooling. Exams used to be administered mostly to decide where to place kids or what kind of help they needed; only recently have scores been published in the newspaper and used as the primary criteria for judging children, teachers, and schools-indeed, as the basis for flunking students or denying them a diploma, deciding where money should be spent, and so on. Tests have lately become a mechanism by which public officials can impose their will on schools, and they are doing so with a vengeance. So what accounts for this? Do most people in the field of education recognize the problems you’ve described here? There are no data on this, but my impression is that the people who work most closely with kids are the most likely to understand the limits of standardized tests. An awful lot of teachers-particularly those who are very talented-have what might be described as a dislike/hate relationship with testing. But support for testing seems to grow as you move away from the students, going from teacher to principal to central office administrator to school board member to state board member, state legislator, and governor. Those for whom classroom visits are occasional photo opportunities are most likely to be big fans of testing and to offer self-congratulatory sound bites about the need for accountability. But what happens when teachers or students explain that they’d rather pursue other kinds of learning, that they don’t care about scores? Doesn’t this lead the people in charge to rethink the value of the tests? Finally, there’s the big one: the most predictable consequence of high-stakes testing, which is being noted with increasing bitterness by teachers all over the country but is rarely understood by those outside the classroom. And that is … ? Even in classes less noticeably ravaged by the imperatives of test preparation, there are hidden costs-opportunities missed, intellectual roads not taken. For one thing, teachers are less likely to work together in teams. For another, within each classroom “the most engaging questions kids bring up spontaneously-’teachable moments’-become annoyances.” Excitement about learning pulls in one direction; covering the material that will be on the test pulls in the other. Thoughtful discussions about current events are especially likely to be discarded because what’s in today’s paper won’t be on the exam. Furthermore, it is far more difficult for teachers to attend to children’s social and moral development—holding class meetings, building a sense of community, allowing time for creative play, developing conflict-resolution skills, and so on-when the only thing that matters is scores on tests that, of course, measure none of these things. Indeed, there is anecdotal evidence that a greater emphasis on heavy-handed discipline to enforce order may be one more consequence of the imperative for test preparation. These disturbing changes can take place whenever people’s attention is drawn to test scores. But if bonuses for high scores are dangled in front of teachers or schools—or punitive “consequences” are threatened for low scores-the chances are far greater that a meaningful curriculum will be elbowed out to make room for test-oriented instruction. And this is most likely to happen in schools that serve low-income students.